The train ride already rewards us for getting up early. The sun makes the sky shine in glowing blue and the landscape in lush green. The view on the Staffelsee near Murnau is particularly beautiful. It is embedded heavenly into the prealpine lands and passes by on our right hand side. 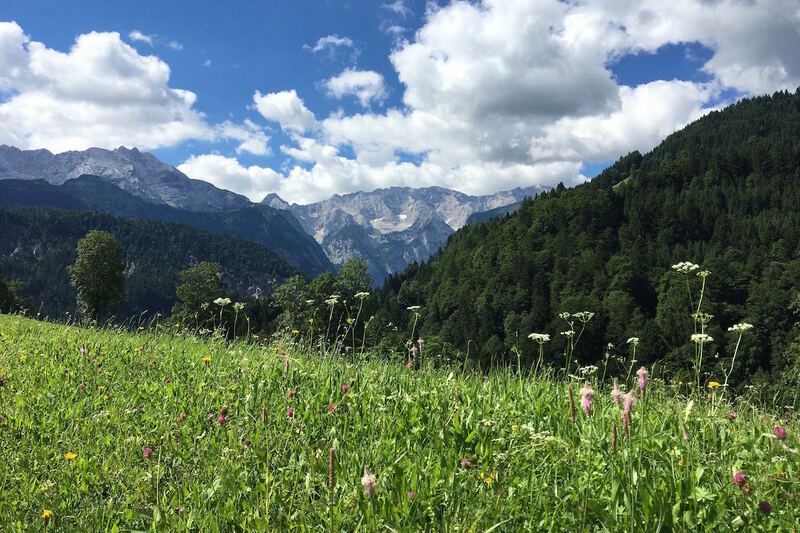 In Garmisch-Partenkirchen we are very close to the mountains. We can see the peaks above the roofs already at the train station’s platform. We take bus number 2 in the direction to Klinikum (hospital) and exit at Skistadion (skiing stadium). Our view is attracted by the ski jumping hill that reach into the sky. We pass it by to the right and walk along the river Partnach upstream. The valley slowly gets narrower and we see a few taverns with beer gardens. It is pretty quiet still. But it’s only just after nine. We reach the ticket office and shortly after a barred door in the rocks. Above it it says “Partnachklamm” and explains that this is a national geotope that was made accessible to the public between 1910 and 1912. We pass through the door and enter the gorge. The path leads through dark tunnels and along the Partnach that loudly rushes past us. It is wet. I have to duck again and again. Especially because our daughter is sitting behind me in the child carrier. The sight of the up to 90 meter high cliffs is impressive. Water runs down at countless spots. 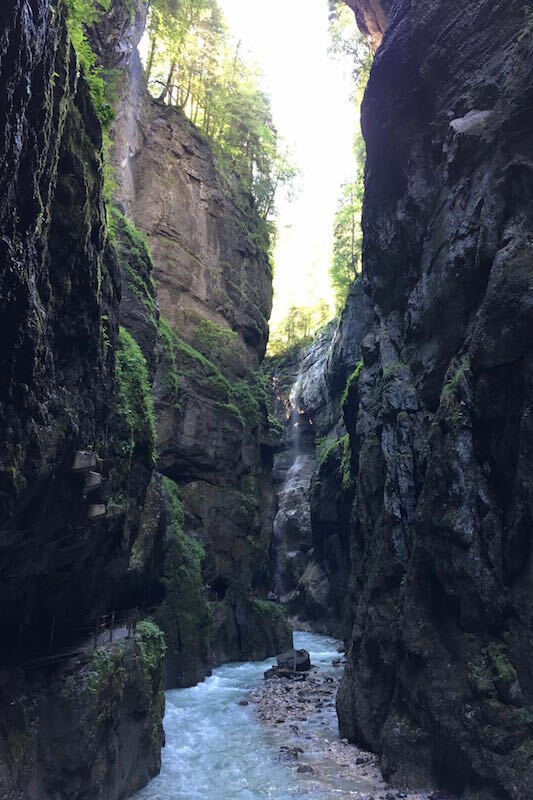 After about 700 meters we reach the exit of the Partnachklamm. It is quiet again. And dry. We take a deep breath. We then ascend under trees into the direction of Grasegg. The path leads out of the forest and along meadows. We walk by a few houses. Just past the hotel DAS GRASECK we make a break at a beautiful field of flowers. Eating, drinking and enjoying the surroundings. In the south we can see the mountains that form the Wettersteingebirge. An impressive view. After we recharged our batteries, we put on our backpacks and walk up in the direction to Eckbauer. The path leads us into the forrest again. We ascend the mountain in serpentines. We climb higher and higher. Soon the path we walked a few minutes ago is as small as in a brochure of the local tourist office. I feel the weight on my back more and more. It feels as if I’m carrying two crates of beer up the mountain. My legs are getting heavier and heavier. Then I hear brass music. It pulls me up. The steps are getting easier. A smile is flashing over my face. This is Bavaria. This is home. The gentle sounds guide us until we reach the Gasthaus Eckbauer. They originate from a mass that is held open air. We attend it for the last few minutes. The people are standing or sitting on beer benches. After mass our hunger drags us onto the terrace. From here we have a stunning view of the mountain panorama. We provide ourselves with food and drinks and sit down at a table. Soon the brass band joins the beer garden. 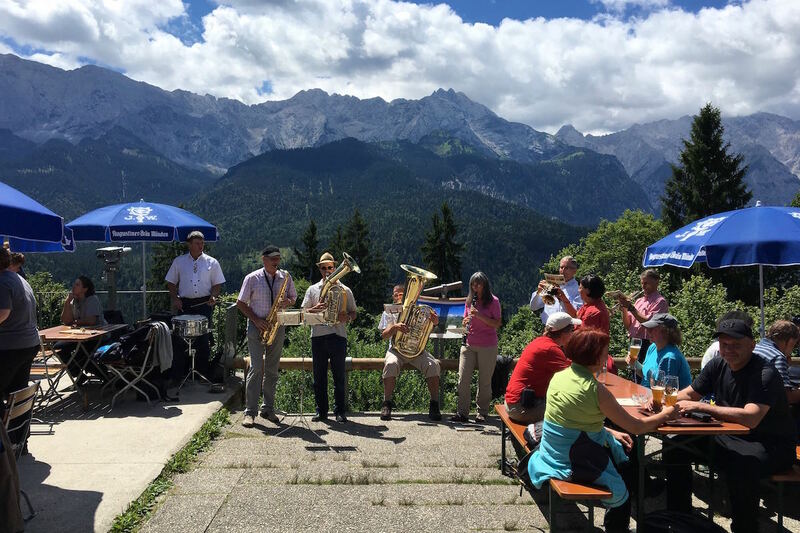 The merry Bavarian music makes the food even tastier. This is the reward for getting up early in the morning. We are happy and proud that we did this hike and managed an altitude of 500 meters well. Our daughter wants to check out the playground. There are a lot of children happily playing on swing and slide. They all talk Bavarian. 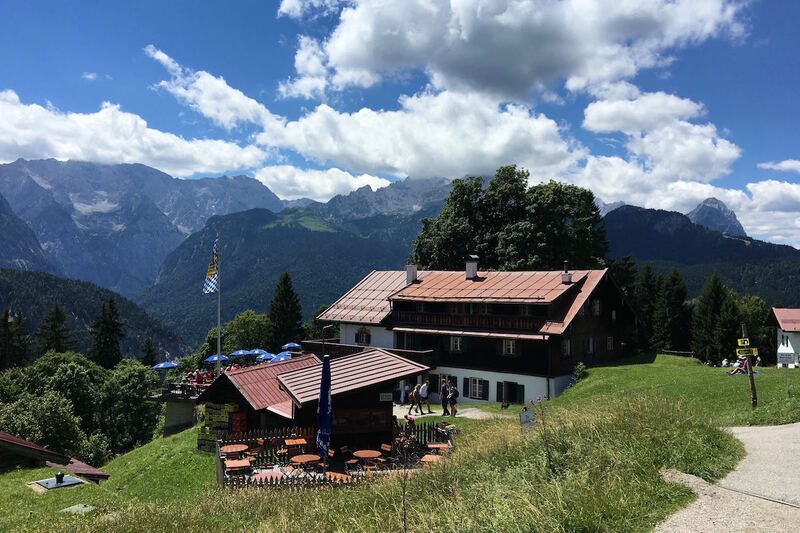 We then walk a few meters to the summit station of the Eckbauerbahn and take the open twin cabin of the cable car down to the valley. It is a marvellous calm ride with wonderful views. We are quiet and enjoy the moment. After reaching the valley station we get ourselves an ice cream and let in melt in our mouths on the benches of the skiing stadium. The ski jumping hill looks even more impressive if you’re standing at its very bottom. Then we have to say bye-bye and until next time and take the bus and train home. It was a wonderful trip. We can really recommend it. You can master it even if you’re not an experienced hiker and/or you want to do it with children. We got the idea for this trip in the German book Die schönsten Familienwanderungen in den bayerischen Alpen. In this book, the author Stefan Herbke describes many additional hikes.